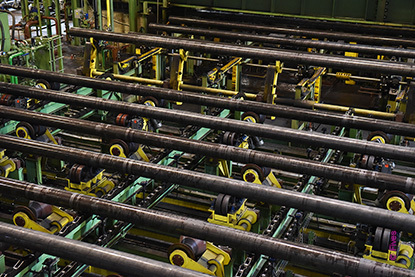 Pipe testing machines at tube plants aim to reduce delays on the finishing floor during the testing phase. The test hold time is varied to suit the specific standard to which the pipe is being tested. Fives has been specializing in engineering hydrostatic pipe testing machines under the brand Taylor-Wilson since 1911, having supplied more than 49 of hydrotesters, leak testers and collapse testers worldwide. The hydrostatic pipe tester designed and supplied to Düsseldorf-Rath plant has the ability to test beyond the standard API grades, and is capable of testing up to premium Cr13 pipes at over 1250 bar (18,130 PSI). With a maximum diameter of 406.4mm (16”) and a heavy wall thickness up to 50mm (1.97”) the end load of 8,944 kN (2,010,620 pounds) is one of the highest Fives has ever manufactured. This technically demanding machine will push the limits of small batch processing while still providing the highest quality and flexibility. This machine is also designed to facilitate maintenance and quick tool change. The Taylor-Wilson hydrostatic pipe testing machines were the first to address alternative pressures that the American Petroleum Institute (API) implemented to deal with the ever-changing demands in drilling for oil in deeper and harder to find areas throughout the world. The Taylor-Wilson machines are capable of testing tube and pipe with O.D. from less than 25mm to over 660mm. Designs can accommodate plain end or square cuts, API line pipe ends, threaded and coupled ends, mill sawed or pierced ends. Fives has already supplied more than 10 straightening lines to different Vallourec’s plants in the past ten years, showing the trust they have in Fives and their confidence in the technology and equipment.